Sara and I took a walk along the Mississippi River yesterday, along the Winchell Trail, between Franklin Ave and Lake St. It was a chilly walk. The Winchell Trail runs down in the gorge on the side of the bluff. It was quite grey. On the way back we walked on the paved path that runs along West River Pkwy on top of the bluff. We saw more color. Probably because on top of the bluff we were looking into the tops of the trees growing lower on the bluff. Sara noticed some Box Elders blooming and asked what they were. I like walking with Sara, for a number of reasons, but partly because she notices the little things going on in the natural world, but doesn't make it her business to necessarily know what they are; she can appreciate them as they are. Box Elders are a much maligned tree. They are often considered weedy because they grow fast, fall apart, and die young. They often show up in the forgotten places of our world, like that weedy spot along the railroad tracks or behind the old factory. I like Box Elder Trees. I especially like them in the early spring. Box Elders add a little color in a mostly brown and bare early Minnesota spring. If they do manage to grow to a large size, they oftern make good climbing trees, with a lot of big, low branches. I even like Box Elder bugs (but I've never had one in my house, so maybe that's why). 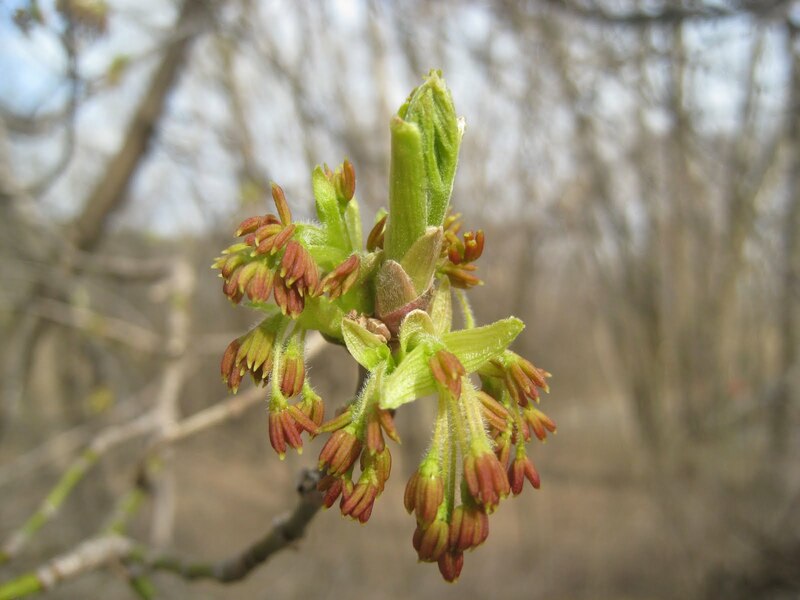 And Box Elders are maples (genus Acer), even though their leaves resemble ash leaves more than maple leaves. 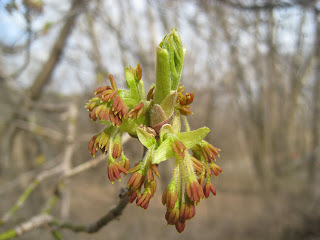 But the flowers are definitely maple (and that's what counts in plant taxonomy). And they have helicopter seeds (samaras) like other maples. And they produce a sweet sap that can be cooked down into maple syrup. Here is a picture of some emerging Box Elder leaves, which I also find attractive. 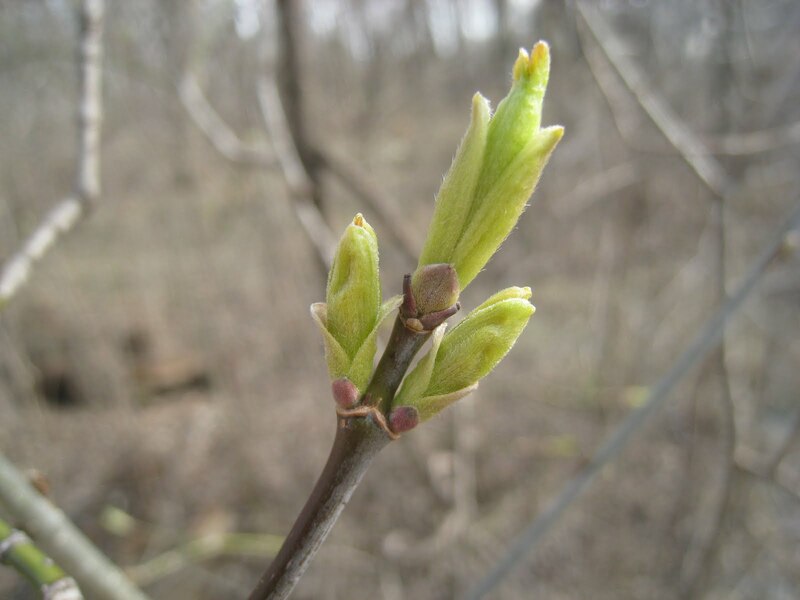 For some more information about Box Elders and their history and place in our landscape, read the Box Elder section in "The Urban Tree Book" by Arthur Plotnik. Read the whole book, and take a walk down your street with new eyes (it's my favorite tree book). Thanks for the kind words about my book (illustrated by the talented Mary Phelan). I love the concept of your blog, and its execution.